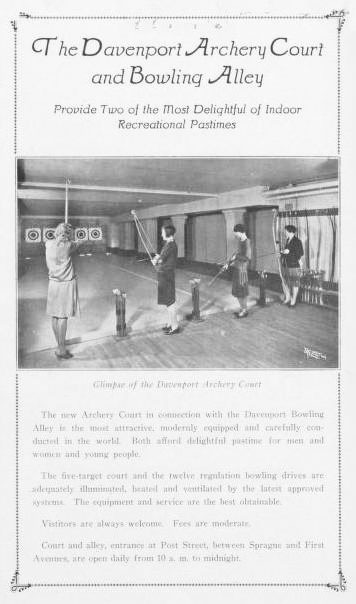 The Davenport Archery Court and Bowling Alley provide two of the most delightful of indoor pastimes. The new Archery Court in connection with the Davenport Bowling Alley is the most attractive, modernly equipped and carefully conducted in the world. Both afford delightful pastime for men and women and young people. The five-target court and twelve regulation bowling drives are adequately illuminated, heated and ventilated by the latest approval systems. The equipment and service are the best obtainable. Visitors always welcome. Fees are moderate. Court and alley entrance at Post Street, between Sprague and First Avenues, are open daily from 10 a.m. to midnight.